Henry II the Pious (Polish language: Henryk II Pobożny ) (ca. 1196/1207 – 9 April 1241), of the Silesian line of the Piast dynasty was Duke of Silesia at Wrocław and Duke of Kraków and thus High Duke of all Poland as well as Duke of Southern Greater Poland from 1238 until his death. During 1238–1239 he also served as a regent of two other Piast duchies: Sandomierz and Upper Silesian Opole-Raciborz. Henry was a son of the Polish High Duke Henry I the Bearded, Duke of Silesia-Wrocław, by his wife (and later Saint) Hedwig of Andechs, daughter of Duke Berthold IV of Merania. He was the second son of the ducal couple, but soon he became the eldest child of the family when the first-born Bolesław died in 1206. Seven years later (1213) the death of his younger surviving brother Konrad the Curly during a hunt left Henry as the sole heir of Lower Silesia. Around 1218 his father arranged his marriage with Princess Anna, daughter of King Ottokar I of Bohemia; this union with the royal Přemyslid dynasty allowed Henry II to participate actively in international politics. Henry I the Bearded quickly began his efforts to designate his sole surviving son as the universal heir of his patrimony, and from 1222, the young prince appears to have signed documents along with his father. Two years later, he had already a separate stamp and his own notary. 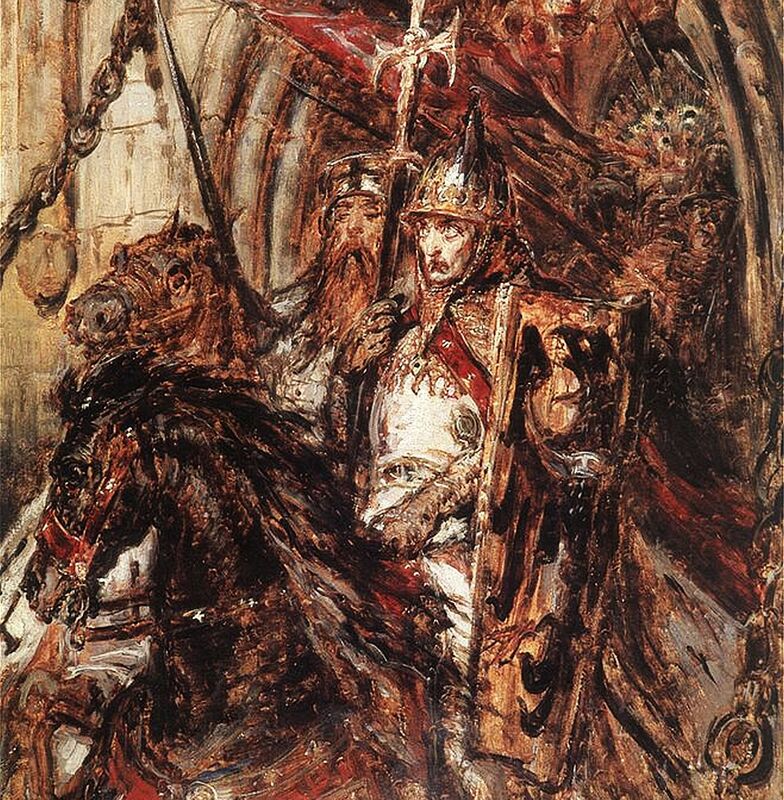 In 1227 during a meeting of Piast Dukes in Gąsawa, Henry the Bearded and the High Duke Leszek I the White were trapped in an ambush, as a result of which Leszek was killed and the Silesian Duke was seriously wounded; this was the first time that the government rested on the shoulders of young Henry. The second time happened two years later, when Henry the Bearded was captured by Duke Konrad I of Masovia. During these regencies Henry II's performance was perfect, thanks to the early years when his father entrusted him with this type of responsibility. During 1229–30, the regent led a military expedition in order to recover and secure the possession of Lubusz Land, and in 1233–34 Henry actively supported his father's affairs in Prussia and Greater Poland. The increasing and close cooperation with his father resulted in the official nomination of Henry as co-ruler with his father in 1234. After that came a formal separation of powers: Henry the Bearded was styled as Duke of Krakow and Silesia, and Henry as Duke of Silesia and Greater Poland. However, his sole reign had to wait until the death of Henry the Bearded on 19 March 1238. Although at the time of his father's death Henry II was about forty-years-old, he took possession of his inheritance with some complications. Actually, the first problem was the issue of his succession. The strong authority of High Duke Henry I the Bearded could secure hereditary rule in his bloodline only over Lower Silesia. Southern Greater Poland and the Seniorate Province at Kraków were ruled by election among the Piast princes, although there existed a testament of the late Duke of Greater Poland and Kraków, Władysław III Spindleshanks, who had left all his lands to Henry I the Bearded. However, the will was ignored by Duke Konrad of Masovia and Władysław's III nephew Władysław Odonic. In the case of the Upper Silesian Duchy of Opole-Raciborz and the Duchy of Sandomierz, Henry could retain his authority as a regent during the minority of their rulers Mieszko II the Fat and Bolesław V the Chaste. Nevertheless one year later (1239) Henry was compelled to resign the regency, although he remained on good terms with the Dukes of Opole and Sandomierz and also managed to retain Greater Polish Kalisz and Wieluń. The situation in the northwest was more complicated: Margrave Otto III of Brandenburg, using the death of Henry the Bearded as a pretext, took the important Greater Polish fortress at Santok and besieged Lubusz. As well as this, Henry II also inherited from his father the disputes with Konrad of Masovia and Władysław Odonic and with the Church, led by Pełka, Archbishop of Gniezno, who claimed the benefits promised by Henry I the Bearded. Fortunately for Henry II, the situation changed unexpectedly after the death of Władysław Odonic on 5 June 1239, leaving two minor sons, Przemysł I and Bolesław the Pious. Using these circumstances, the Silesian Duke took the majority of Odonic's possessions (including Gniezno), leaving to Odonic's sons Nakło nad Notecią and Ujście. Henry's next moves, however, were dangerous: he abandoned the traditional alliance of his family with the Imperial House of Hohenstaufen and supported Pope Gregory IX, which immediately finished his disputes with the Church. Then, to end his conflicts with Konrad of Masovia, Henry arranged the marriages of two of his daughters to two of Konrad's sons: the eldest, Gertrude, to Bolesław, and the second, Constance, to Casimir I of Kuyavia. In 1239, Henry II finally lost the Santok fortress, which was occupied by Brandenburg after his defeat in the Battle of Lubusz. It seemed that the most difficult times for Henry were done - but the worst was yet to come. In the East, a new dangerous opponent appeared: the Mongols, under the leadership of Batu Khan, who, after the invasion of Rus' chose as the next target the Kingdom of Hungary. Batu Khan rightly recognized that in the event of war with Hungary, he firstly had to take control over Poland. Already in January 1241 Batu had sent some reconnaissance troops to Lublin and Zawichost, but the real invasion was launched a month later, by an army of 10,000 men under the leadership of Lord Orda. In Lesser Poland the Mongols didn't have an equal opponent, defeating and killing almost all the Kraków and Sandomierz nobility in the Battle of Tursko (13 February) and the Battles of Tarczek and Chmielnik (18 March) where, among the casualties, were the voivode of Kraków, Włodzimierz and the castellan Clement of Brzeźnica. After this all Lesser Poland, including Kraków and Sandomierz, was in the hands of the Mongols. Henry didn't wait for the promised aid from Western rulers and began to concentrate the surviving troops of Lesser Poland and his own Silesian and Greater Poland forcea in Legnica. Europe's rulers, more interested in the struggles between Empire and Papacy, ignored Henry's requests for help. The only foreign troops who joined him were those of King Wenceslaus I of Bohemia and the combined forces of some French Knights Templars and Hospitallers; some sources report that at the last moment, however, they stopped their troops close to Legnica, probably fearing that the Christian Army would become an easy prey to the Mongolian troops; the tradition that the Teutonic Knights were also represented by a small contingent is today disputed. The battle took place on 9 April 1241; Henry was defeated and killed in action. The defeat was widely blamed on the European monarchs, especially Emperor Frederick II and King Béla IV of Hungary, who had refused to help, and the unexpected and humiliating escape from the battle of Henry's Upper Silesian cousin Mieszko II the Fat, who was tricked by the Mongols into retreating in the decisive moment of the battle. There are two descriptions of Henry's death, one submitted by Jan Długosz (today considered dubious), and the second by C. de Brigia in his Historii Tartatorum, which, based on reports of direct witnesses, is now considered more reliable. Fortunately for Poland, the Mongols didn't intend to occupy the country, since shortly afterward they went through Moravia to Hungary, wanting to connect with the main army of Batu Khan. Henry's naked and decapitated body could only be identified by his wife, thanks to a unique anatomical defect: on his left foot, he had six toes (polydactyly), which was confirmed at the opening of his tomb in 1832. Henry was buried in the crypt of the Franciscan Church of Sts. Vincent and Jacob in Wroclaw. Despite ruling for only three years, Henry remained in the memories of Silesia, Greater Poland and Kraków as the perfect Christian knight and lord, whose brilliant career was stopped by his early death. Upon his death, the line of the Silesian Piasts fragmented into numerous Dukes of Silesia, who (except for Henry's grandson Henry IV Probus) were no longer able to prevail as Polish High Dukes and subsequently came under the influence of the neighbouring Kingdom of Bohemia. Gertrude (ca. 1218/20 – 23/30 April 1247), married by 1232 to Bolesław I of Masovia. Constance (ca. 1221 – ca. 21 February 1257), married by 1239 to Casimir I of Kuyavia. Bolesław II the Bald (ca. 1220/25 – 25/31 December 1278). Mieszko (ca. 1223/27 – 1242). Henry III the White (1227/30 – 3 December 1266). Konrad (1228/31 – 6 August ca. 1274). Elizabeth (ca. 1232 – 16 January 1265), married in 1244 to Przemysł I of Greater Poland. Agnes (ca. 1236 – 14 May aft. 1278), Abbess of St.Clara in Trebnitz (aft. 1277). Władysław (1237 – 27 April 1270), Chancellor of Bohemia (1256), Bishop of Passau (1265) and Archbishop of Salzburg (1265–70). Hedwig (ca. 1238/41 – 3 April 1318), Abbess of St.Clara in Wrocław. ↑ Historyczne, Polskie Towarzystwo (1961) (in pl). Mowia, wieki: magazyn historyczny. Państwowe Zakłady Wydawn. Szkolnych. p. 52. http://books.google.fr/books?id=mYYSAAAAIAAJ&q=Henryk+II+Pobo%C5%BCny+sze%C5%9B%C4%87+palc%C3%B3w&dq=Henryk+II+Pobo%C5%BCny+sze%C5%9B%C4%87+palc%C3%B3w&source=bl&ots=ADjxnG-mpB&sig=PfH1GzekAYo7uOXpbD0Qbbw7nIM&hl=fr&sa=X&ei=S8lSUL_sBoWm4gT2ioHQDQ&redir_esc=y.